It is ironic that as aircraft have gotten more sophisticated, much of their manufacture has remained manual. However, as orders for commercial aircraft have dramatically increased over the past years and are expected to remain on that trajectory, the competition has become not just about how fast new technologies can be put on the aircraft, but about how fast the aircraft can be manufactured and delivered. Enter ever increasing automation and robotics. Just as it has taken multiple years to reach the sophisticated content levels on current generation aircraft, so too has it been necessary to continually learn new ways and means to increase automation on the manufacturing floor. For both aircraft on the flight line and on the production line, safety is paramount. This book will look at a variety of topics that range from the risks and rewards of increased cooperation between humans and robots within manufacturing systems, to introducing a process that enables the determination of whether the robot or the human gets assigned a particular task, to the configuration and optimization of flexible assembly cells, all with the end goal of safely reducing time-to-market and production costs. 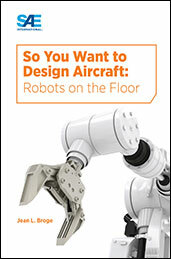 If you do not have access to SAE MOBILUS via username/password or institutional access, you can still purchase the Book, So You Want to Design Aircraft: Robots on the Floor.